The bride enters the room and walks down a long petal-speckled aisle. Waiting at the end is her husband-to-be. Everything is perfect in that moment. But what will that moment look like? And where will it take place? In the South, weddings are reunions. They are a weekend-long affair where friends and family on both sides spend the weekend dining, dancing and sharing memories. They often feel more like a mini-vacation than a one-day event. One of the most exciting wedding trends in recent years that is currently going stronger than ever is the push to step away from tradition and look toward creativity. Couples want to incorporate elements of their personalities into every aspect of their big day. Here are some ways brides and grooms are breaking the mold. 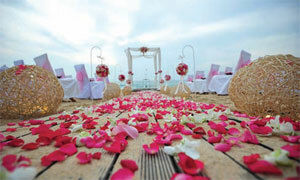 Many couples are choosing to have a theme that touches on different aspects of their wedding. One popular trend is a roaring ‘20s- and Great Gatsby-theme affair. Lavish gold accents, ‘20s-style invitations and even music of the era can all be tied together. Bohemian glamour is another popular theme for 2014 weddings and can be a simple one to incorporate by using floral garland, wooded elements and relaxed, flowing dresses for the bridesmaids. Last August, Laren and Daniel Moskowitz celebrated a beautiful, eightyear romance when each finally got the rare privilege of marrying their best friend. The couple’s story began when a gentleman came into Laren Moskowitz’s (then Laren Brown’s) real estate office to pick up the keys to a property. Moskowitz, working from her office in the back, was called to the front by the office’s receptionist who later revealed she thought the handsome, darkhaired visitor seemed like someone Moskowitz would immediately hit it off with. She guessed accurately. The couple both work in real estate, Daniel Moskowitz as an associate broker at Dunes Marketing Group Real Estate, and Laren Moskowitz as a sales associate at Schembra Real Estate Group Inc.
You can’t throw a spoon in a restaurant these days without hitting someone who has a food allergy, sensitivity or personal dietary restriction. Bringing a glutenfree dish to a dinner party or a batch of nut-free cookies to your child’s classroom is now the norm, not the exception. So you can imagine how complicated it’s getting to cater a wedding. The event planning publication Special Events recently polled 100 caterers about their changing business, and 95 percent said that in the past five years, the percentage of specialty orders they plan has steadily grown. Jewelry stores are buzzing with eager guys ready to pop the question. Girls typically want to have some say in the chosen ring. According to 2010 study by Tacori, a diamond leader, found that 70 percent of women do want to have some part of the selection process. The engagement ring is supposed to last forever, so that usually means she wants to be happy with the final outcome. In meeting with a couple yesterday, the groom stated that the most important part of his decision in selecting his finance s ring, was the salesman behind it. LONG HAIR OR SHORT HAIR, CURLY HAIR OR STRAIGHT HAIR, A FLAWLESS BRIDAL UPDO IS OF UTMOST IMPORTANCE TO THE BRIDE. A BRIDE NOT ONLY DREAMS OF HER PERFECT DAY, BUT LOOKING HER ABSOLUTE BEST AS WELL. THE KEY TO LOOKING GOOD IS IN THE PREPARATION. 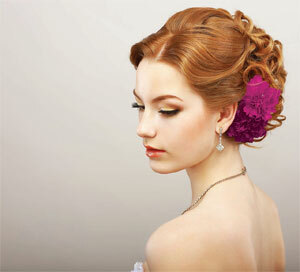 Brides should schedule their hair trials about three months prior to the wedding. Pictures of bridal updos that are inspiring to the bride should be taken with her as well as a veil or headpiece she plans to wear. Pinterest is a great resource for hair-style inspiration. The more prepared you can be for your stylist, the better the communication process will be during the trial, as well as the day of the wedding. If you like the look of the front of a hairstyle in one picture, and the back hairstyle of another picture, bring them both. A bride should wear makeup to the hair trial, or combine the hair and makeup trial on the same day. This will help the bride get the best visual of how her look will come together on her wedding day. When you start planning a wedding, you think you’re hosting one big party. But along the way someone will helpfully point out that there are several other parties you should be planning too. (This helpful person will most likely not be helpful enough to pay for said parties.) These complementary wedding parties are like cousins to the actual wedding: They’re not mandatory but they are traditional, and some could even be considered expected. The good news is you’ll have help planning them – in fact in some cases you won’t even be in charge! (Deep breaths…) To get you started, we’ve compiled a simple list of ‘dos and don’ts’ for each of these wedding-related soirees. Now that’s helpful. Your wedding day is so much more than just you and your spouse-to-be standing in front of God and family to declare your love for one another. It is a minefield of possible disasters that you must avert at all costs. It is a lovely chance to reconnect with family. It is a crisis-management gauntlet you must run while looking fabulous every step of the way. And it is a once-in-a-lifetime chance to express yourself. All of this, the good and the not-so-good, makes up your big day. The wedding reception candy bar is a thing of the past. The make-your-own s’mores station has been played out. Mini cupcakes? So 2009. 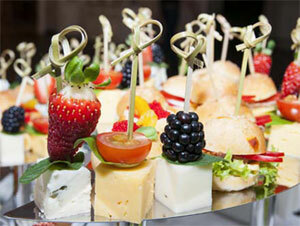 So what hidden menu surprises are brides and grooms offering their guests these days? The answer, oddly enough, is a late-night snack. If you have ever attended a wedding, or a formal affair, the meal is always that one aspect that will be remembered for being a hit or a flop. Wedding food could and should be amazing; it should be something to remember when you and your guests look back on your wedding day. In the overall wedding budget, the largest amount of the couple’s money will be spent in this category, so plan with care when selecting the caterer, the menu, and style of service for your wedding. 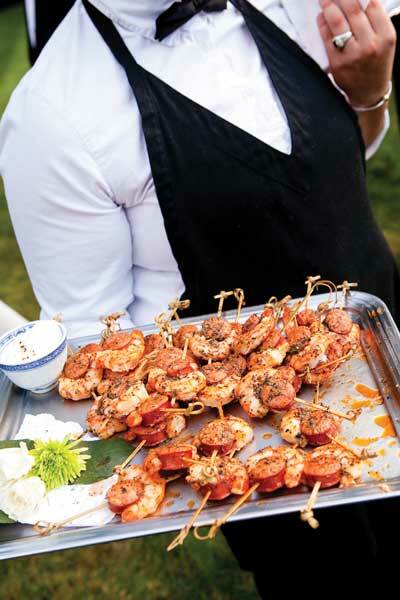 When selecting a venue (see March column), you’ll notice some venues have their own exclusive caterer or in-house food and beverage department. 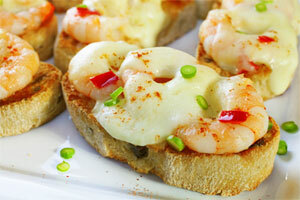 Otherwise, a couple must research off-premises caterers to fulfill this position. 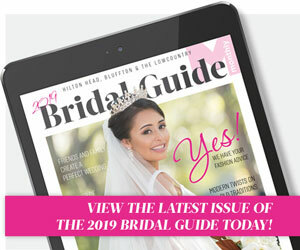 Click a banner below to check out some local-flavored inspiration, go behind the scenes at a couple of awesome island weddings, pick up a few pointers on Pinterest, and learn how to handle the dreaded Naughty Groomsman. It's all at your fingertips in our Bridal Guide. Today’s bride is a savvy one. She’s a bit older than her peers from previous generations, so she has a little more dough to spend and a more refined style to showcase. She’s a tech-savvy pinner who has solid DIY intentions but Hollywood wedding dreams. She also has a full-time job, a sizable social circle and a lot on her plate, even before The Question was popped. In short, she’s the perfect client for a wedding planner. The wedding planner’s first job is to sit down with the couple and find out their vision for the day: The dates they’re looking at, the number of guests they’d like to plan for, the style, and a rough budget for the whole shebang. “Stay local, buy local goods for favors and embrace Lowcountry style and settings,” said Ashley Rhodes. Rhodes has planned a score of Lowcountry weddings, and is full of ideas for making your local wedding one-of-a-kind. Details abound, such as the sweet potato butter from Lowcountry Produce given out as wedding favors. “They were listed in Oprah’s favorite things four years ago,” Rhodes added.